To access this page, in the PROJECT section of the ADMIN module, on the list the shows the available groups of settings, click MODULES. 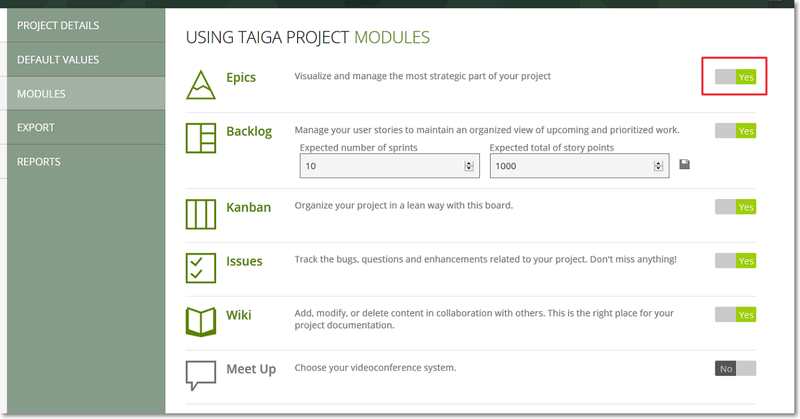 On this page, you can enable or disable some of the modules that appear on the Taiga Panel for the current project. To enable or disable a module, on the right side of that module’s name, move the slider to Yes (green – enabled) or to No (grey – disabled). Any changes you make are automatically applied. Note: Some modules that appear on the Taiga Panel cannot be enabled or disabled. Note: You can exceed the expected number of User Story points you set for the current project. The excess of points is shown with red on the project completion bar on the BACKLOG page. In addition, if you have User Stories on the BACKLOG which you estimate with a certain number of points and this results in exceeding the total number of points you set for the project then, those User Stories are displayed under the red Project Scope doomline. To save any changes you make for the Backlog module, on the right side of the Expected total number of story points box, click . When you enable the Meet Up module, before saving, you have to select one of the available videoconferencing systems or select Custom and then enter an URL for your preferred chat room. Note: When you select one of the available videoconferencing systems, you can also enter a code that is automatically added to the URL that you send to the people you invite to the chat. To save any changes you make for the Meet Up module, on the right side of the text box where you can enter a custom URL or a chat code, click .